Select your color schemes with confidence. Artists love color. But, there is such a bewildering array of colors. We need a plan to control all the colors. 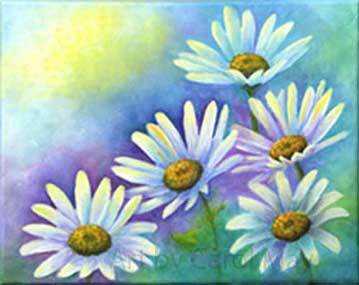 Limit the number of colors in each painting, so your paintings will have more cohesion and harmony. Your viewers will find them more pleasurable. Normally I use only 3 or 4 colors for each painting. Any additional colors are then mixed. When the additional colors are mixed from the original 3 or 4 colors, they always exhibit color harmony. The color wheel is our key to mastering color. You may purchase a color wheel from your local art store. 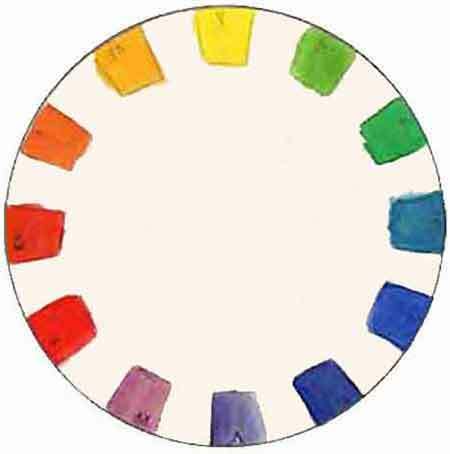 The best option is to paint a color wheel from the colors you use on your palette. Make yourself templates of the common color schemes used by painting artists. These templates have served me for years to select my painting colors. Click for enlarged color scheme templates, so you can make your own. The color schemes I use the most often are the Compliment + 1/2 Left and its brother Compliment + 1/2 Right. My second most used template is the Split Compliment. 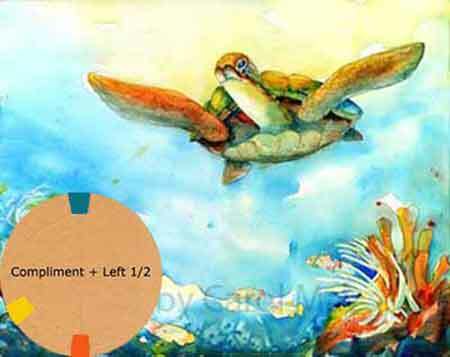 Try each template over the color wheel to find a template that suits your individual painting. Here the main subject was the turtle. Burnt sienna, a red-orange was his dominant color. We need complimentary colors to mix the dark colors. 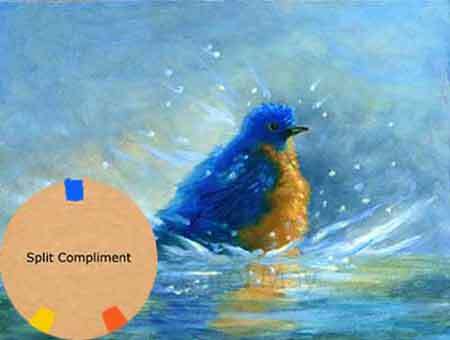 The compliment of burnt sienna is the blue-green. Yellow was great for the sunlight areas of the painting. Depending on your selected color scheme, you may include another color or two. Clip the template to your color wheel. Refer to it and lay out the selected colors on your palette. 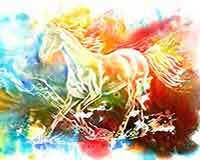 The color schemes will keep you on track and give you beautiful, harmonious paintings. If you are pressed for time you can purchase a Color Wheel with a Color Mixing Guide from Amazon. These have been my go-to color schemes for over twenty years and I am happy to share them. Let your artistic license run wild. One of my earliest painting lessons was to do a painting with only one color. The lesson was to teach us to see and use values in our paintings. Monochromatic paintings are done with only one color. White will give you various tints of the color. The addition of black will create various shades of the original color. 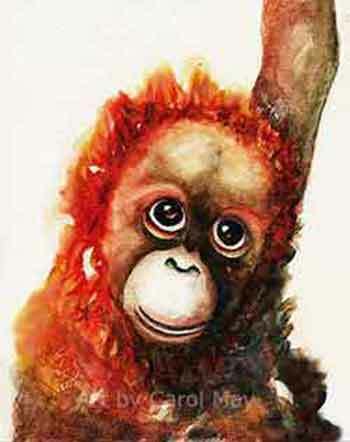 This orangutan is basically orange, so this is the closest example from my current paintings. 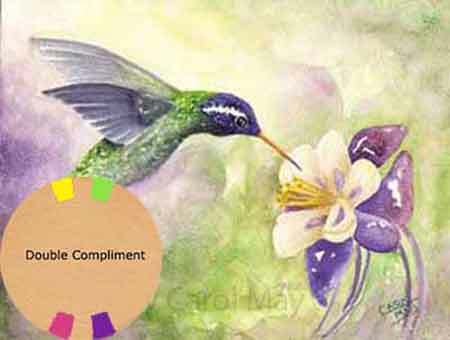 Compliments are any two colors directly across the color wheel from each other. 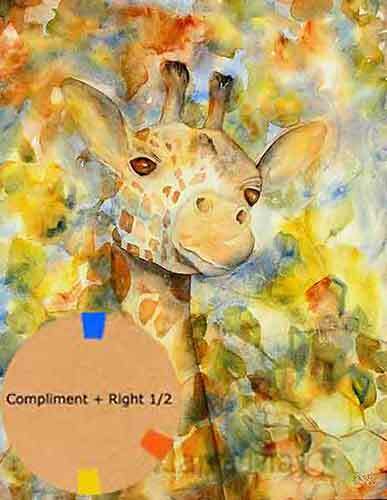 Complimentary colors can be used for high contrast paintings. Complimentary colors are also used for mixing darks and other neutral colors. 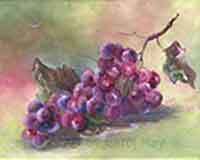 In this painting I used the color yellow-green with its compliment red-violet. 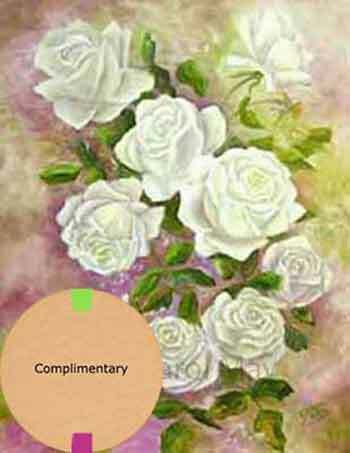 White softened the colors for a lovely rose painting. Here I used the same two compliments as the rose painting. But to give the painting more variety, I added a color next to each compliment. This gave me some brighter colors for the highlights by adding yellow. The addition of purple gave more depth to the darks. 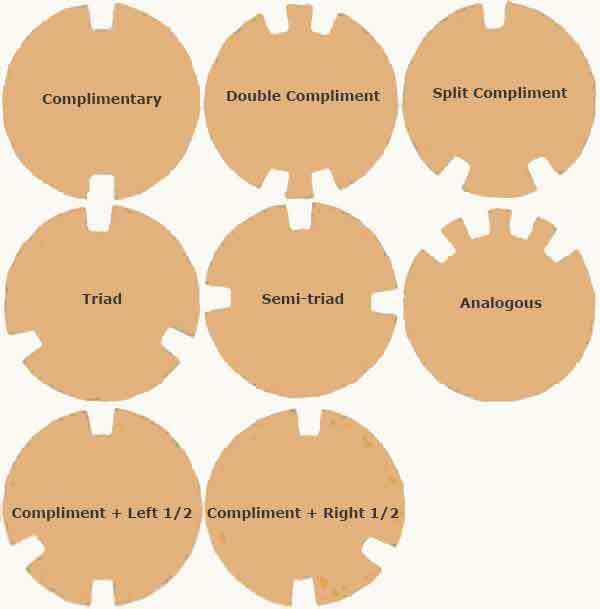 A split compliment color scheme uses the colors on each side of the direct compliment. Here I chose orange and new gamboge yellow with ultramarine blue. Blue and orange are compliments for making the darks to darken the feathers, his dark beak and eye. Yellow was used for the highlights on his chest. Compliment plus a half left (the turtle painting, above) and compliment plus a right half are the color schemes I use the most often. 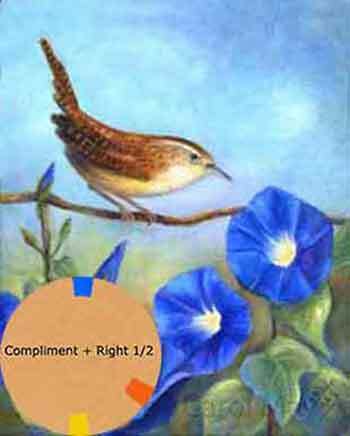 Complimentary colors are any two colors directly across from each other on the color wheel. 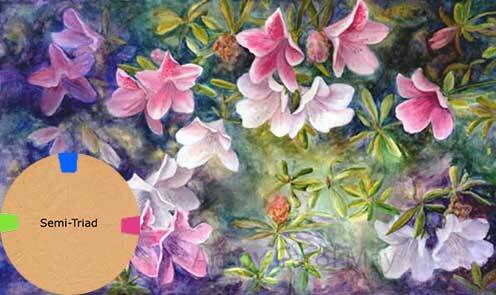 The addition of a complimentary color adds zing to your painting with value contrast. Orange and blue are mixed to create the browns. The greens are mixed with the yellow and blue. 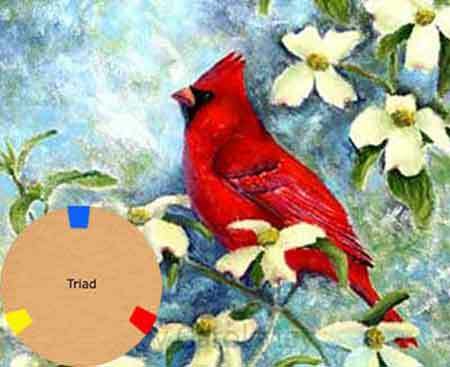 The triad painting color scheme uses three colors spaced equally around the Color Wheel. A triad color scheme gives a balanced painting. Turn the color scheme template and select any three equally spaced colors that suit your subject. This painting uses the primary colors red, blue and yellow. The greens and dark colors were easily mixed from these primary colors. The semi-triad painting color schemes use two primary colors with a secondary color. The primary colors are always ideal for mixing other colors. 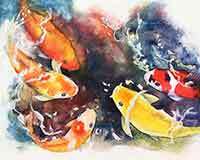 If you use single pigment colors, the secondary colors are also good for mixing. Here I used blue, violet-red and yellow-green. An analogous color scheme is made of three or more adjoining colors anywhere on the color wheel. They may be either warm or cool colors or a combination. 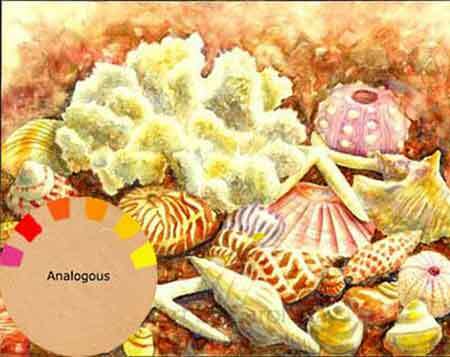 Analogous colors have automatic color harmony because they are adjoining colors. I did this sea shell painting from actual shells I set up. Their natural colors were in perfect harmony. Make your own color wheel and color scheme templates. 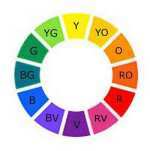 Or you can purchase a Color Wheel with Color Schemes by Grumbacher. May you have many beautiful paintings!